I have been woefully absent these days, and with so many things left unfinished I'm almost beside myself with shame. Almost. So without further ado some new things I've been tinkering with. A personal favorite of many powersuit users. As tall as a grown man this huge metal club can pound enemies into a pulp with one hit, and those tough enough to survive often find themselves reeling from the sheer impact of the weapon's mass. The Frontier series of arms has been produced by Sherman Arms almost since the colonization of Mars. The weapons are designed to be simple and rugged, able to function even after decades without maintenance or abuse. The drawbacks that come with this design, low stopping power and fire-rate, are acceptable to those who just need a gun that will shoot straight when needed. The Liberty rifle is a lever-action rifle fed from a box magazine. Made out of hardwood and stainless steel it has a classic finish that exemplifies the freedom of the Capitolian homesteaders. DEPENDABLE: The weapon’s design makes it extremely dependable in battle. When making a Ranged Weapons test to fire this weapon, you may ignore the first Repercussion rolled. A simple double-action six-shooter, this gun can be repaired or modified by anyone with half a brain and a toolbox. Available in many finishes, it is most often sold as a set with the M76 Liberty rifle. Qualities – Close Quarters, Dependable, Hidden 1. For all those needing to kill with one shot, whether a beast or a human, Lancaster Arms has designed the Howdah Pistol. This massive handgun sports between one and five high caliber barrels, which are loaded with rifle ammunition or shotgun slugs depending on the particular model. The chopping blade carried by the personal bodyguards of the Imperial Serenity. Also used by many members of the criminal underworld because of its fearsome reputation and stopping power. The street version is made from steel with a bakelite grip, the blades used by Serenity's bodyguards are silvered and their handles are made out of ebony. 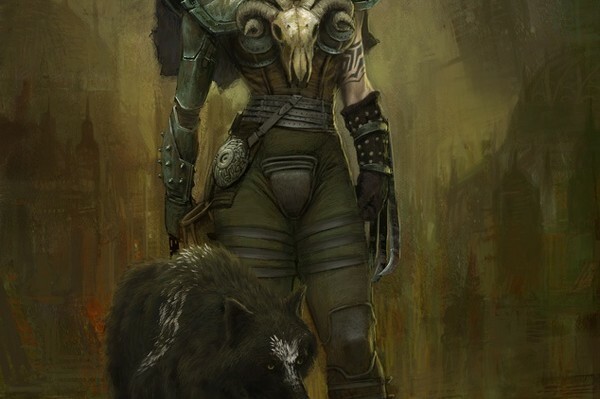 A woman-only specialisation within the Wolfbane Commandos, the Mourning Wolves focus on distraction, incapacitation and intimidation. Painting their faces in deathly visages, they charge into battle armed with barbed tangle chains to bind their foes and the bladed gauntlet known as ‘the Claws of the Wolf’ to administer the Coup de Grace. Working in concert with other Mourning Wolves or with fellow Wolfbanes, they use their wiles and weapons to prey on an opponent’s weaknesses and open them up, harassing their foe until they make a fatal mistake. Legend has it that the role was created for the vengeful wives and lovers of Imperial soldiers lost in battle, a myth that the Mourning Wolves are happy to perpetuate, as it only adds to their reputation for savagery and viciousness. Mandatory Skills - Acrobatics, Close Combat, Persuade. Elective Skills - Stealth, Athletics, Observation. Signature Skill - Acrobatics, Athletics, Close Combat, Stealth. Wolfbane: Mourning Wolves, like their Wolfbairn packmates, renounce all ties to clan and family when they join the Wolfbane Commandos. They are now and forever more members of the Wolfpacks. This career counts as being Military (Wolfbairn) for purposes of functioning as a prerequisite for other careers. Those who show a talent for the brutal, close-quarters combat Mourning Wolves specialise in are a rare breed, as weapons they employ require skill and finesse, and a mistake can prove fatal. Those who survive their first tour with the Mourning Wolves can challenge for the right for a place amongst the Alphas, those who have raised the unique combat style of the Mourning Wolves to an art form. As well as being formidable warriors in their own right, Mourning Wolf Alphas serve a vital role as squad leaders and mentors to younger packmates. Elective Skills - Stealth, Athletics, Command. Signature Skill - Acrobatics, Close Combat, Command, Persuade. Talent - Two talents from Acrobatics, Close Combat, Persuade or Command. Equipment - Mk. I Light Personal Protection Suit, Claws of the Wolf, Tangle Chain, Choice of 1 Assault Rifle, Pistol, Shotgun or SMG from either the Imperial or Cartel Armouries, or a Clansman’s Claymore. The idea was to provide a basic career and an iconic career to go alongside it. I also wanted to allow options for the basic career beyond the Iconic career as well that kept with the Wolfbane theme, hence allowing it to function as a prerequisite for the Wolfbane Commando IC. It's also worth noting that the careers do focus very heavily on melee combat, but there are some social options there as well. Persuade is a good skill for distraction and intimidation, and I gave the IC the option of taking Command to reflect the leadership role I see the having (since I created them basically by rolling the chieftainess/hero from Casualties of War into the one IC). Amongst the Highland Clan Warriors, skill with a blade is seen not only as a measure of a warrior’s worth in battle, but also as mark of his devotion, dedication and discipline. As such, those who manage to earn the title ‘Swordmaster’ are highly regarded by their compatriots. Masters of close combat, they have honed swordplay into an art form respected across the solar system. Wielding their beloved claymores, the Highland Swordmasters are nigh-unstoppable. Elective Skills - Acrobatics, Observation, Willpower. Talent - Select 1 talent from Close Combat, and 2 talents from Athletics, Acrobatics, Close Combat, Resistance or Willpower. So, I decided to give the Highlanders an IC to aim for. Again, it's focused on close combat, but that's pretty much the Highlander's schtick. I made it quite exclusive to reflect that you don't get to call yourself 'Swordmaster' without having some serious skill to back up your claim. Mind you, if you really wanted to go for horrible CC monkey, you can get 3 close combat talents out of the IC. Prepare yourself Sir! I shall throw poo at you. First, the descriptions are good. I like them. Requirement: The Mourning Wolves recruit from war widows. There is little fluff about them, but what's there stresses this fact. I would add it. Attributes – I have never seen a primary career with more than one attribute of +3, yours has two. I wouldn't allow it since it skews the character too much in one direction, in this case close combat. Skills – I'm not really convinced this career needs Persuade. Especially since battlefield intimidation is such an underdeveloped part of the system. Prerequisites: Why is it harder to become a Mourning Wolf Alpha than a Wolfbane? The Wolfbane has a D1 test and no skill prerequisite, the Alpha has a D2 test and a CC Expertise of 2 required. Equipment – two gripes here. The character is provided with Mourning Wolf equipment she already has from the Primary career. And then you added one of the most problematic choices, a free pick from the armory. I would limit the equipment to a claymore or something similar. My personal and biased opinion, I would do it differently. Instead of having a primary career and an IC, I would just go with an IC. A relatively simple one to get into with a D1 test and prerequisites of "Female, must be a widow/partner of an Imperial soldier". This would reflect the fluff. The skills and talents would stress close combat, without command and persuade. 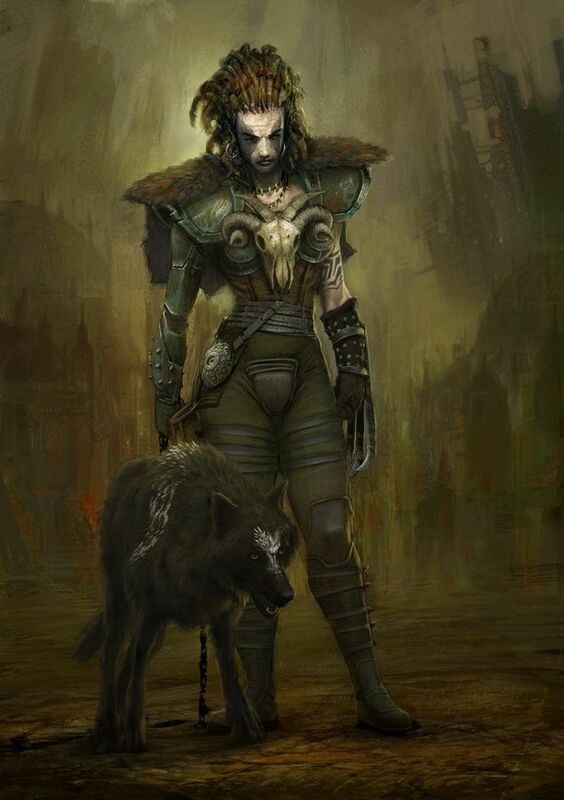 I would give them the standard Wolfbane equipment, and replace the Claymore with the Tangle Chain and Claws of the Wolf. Prerequisites: I have never seen a Talent as a prerequisite for an IC, and certainly not a second tier talent. With an D3 test to qualify this is the hardest IC to get into, but the payout does not match it. Three talents and some equipment is just not enough to justify it, especially since the difference between the Wolfbane IC and this IC is one talent (Wolfbanes are specific primary career plus D1 test). Talents: I would only give the IC access to one Close Combat talent, and two picks from the rest. This is already a CC heavy build, with the primary career as is. Earnings: The best paid military IC in Imperial. Earnings 3 is a better fit compared to other Imperial special forces. Went through the Warzone books and the corporate sourcebooks to update the Military (Basic) career for every corporation. The light infantry is the mainstay of the Capitol armed forces. Their characteristic campaign hat, green uniform and can-do attitude are a strong point of pride for the "doughboys." Most soldiers who survive the initial 4 year enlistment in the light infantry either become superb NCOs or join specialized units. The naval marines are also predominantly made out of light infantry units, but their specialized role and small numbers makes them too distinct from the army units. Equipment: Add a gas mask and armored leggings to the starting equipment. The Assault Rifle received is the M50 Assault Rifle. Bauhaus military doctrine does not have a light infantry component. But it has a reserve force similar to the other corporations light infantry. The Ducal Militia is a defensive unit and is never deployed in offensive operations, for all its training and skill it just isn't up to the task. Equipment and rules: See Bauhaus sourcebook page 32. Anyone entering the Military (Basic) additionally receives a gas mask and armored greaves. The Assault Rifle received is the AG-17 Panzerknacker. Mishima employs peasant soldiers to fulfill the light infantry role. With sub-par equipment and low-status they aren't however of high quality. Equipment and rules: See Mishima sourcebook page 21. The Imperial Regular infantry sees more combat than any other light infantry in the solar system. Imperials aggressive tactics force every man and woman in uniform to serve at least a single tour in a warzone. After surviving their service they either move on to the Trenchers or join the Reserves. Equipment: Add a gas mask, armored leggings, and a combat helmet to the starting equipment. The Assault Rifle received is the Mk. XIb ‘Invader’ battle rifle. The People's Volunteers are very similar to the light infantry of the other corporations. They most closely resemble the Ducal Militia of Bauhaus, which is not surprising since many early military officers of Cybertronic were Homebuilders. Equipment and rules: See Cybertronic sourcebook page 61. The Grapnel Launcher is a device which uses a compressed air-canister to propel a grappling hook to its point of attachment. After attaching itself the launcher can be used to quickly allow its wielder to ascend or descend safely form any height, up to the length of the attached cable. After use the flukes of the grappling hook can be retracted through the push of a button, detaching the hook from its anchor point. A Grapnel Launcher can be used 10 times before the air canister runs out. Mishiman blades are worn openly by the Samurai, but not always is such behavior appropriate and not everyone who needs a blade is a Samurai. For such people a specific type of mounting has been developed. The Shikomizue is a special mounting for the blade, hiding it in a a cane or staff depending on the blade. Such weapons can be carried openly without arousing too much suspicion. There is also an industry producing blades specifically to be mounted in a Shikomizue, these do not differ much from the rapier canes used by other corporations. Quality – Add Hidden 3 to weapon qualities. There is no sport like blood sport, and none is as thrilling as bullfighting. It is an act of art to dispatch a raging bull with grace and poise, and preferably without being gored to death by its long horns. To be allowed to fight in the professional bouts, a prospective Toreador has to undergo training under an experienced master and compete with others in amateur leagues. Only by being acknowledged in an official fight, can someone claim the title of Toreador, afterward a world of glamor and danger awaits him. Bauhaus nobility has no problems treating professional Bullfighters as equals, they are people of honor willing to sacrifice their lives in service to the people, the air of dashing and danger also helps. To the common people they are heroes who rise from the common masses to achieve fame and fortune in their lifetime. To the other corporations they are primitive brutes who mistreat animals, with members of the Imperial clan Fergan paying hefty bounties for the ears and “tails” of killed Toreadors. Prerequisites: Bauhaus, Acrobatics Expertise 1. Elective Skills – Athletics, Observation, Lifestyle. Signature Skills - Acrobatics, Close Combat, Observation, Persuade. Talents – One talent from Close Combat, one talent from Acrobatics, Observation, or Persuade. Equipment – Rapier, flashy clothing. The Barking Spyders officially do not exist, the Spider Platoon testing the new grenade launcher and chemical ammunition was lost in an explosion during a training exercise in the Martian desert. The families of the members were informed and the soldiers symbolically buried with full honors. The Spider Platoon became the Barking Spyders, a secret special unit armed with some of the most dangerous chemicals mankind has ever created. Their mission is simple, to destroy enemies that would otherwise cause an unacceptable loss in life and materiel to the Capitol Armed Forces. The recruitment process is top secret and only the most trusted and stable Capitolians can ever hope to be asked to join, a single Barking Spyder gone rogue has the means to destroy a city if he wishes so. The training is harsh and every prospective member of the unit must learn how to evade being seen and captured, since their weapons could spell doom for Capitol. Prerequisites: Capitol, Military Primary Career, Stealth Expertise 1. Mandatory Skills – Ranged Weapons, Stealth, Survival. Elective Skills – Observation, Sciences, Willpower. Equipment – Raven Type II Grenade launcher, ADMPS-4 Survivor Armor, 4x M25 Nerve Gas Grenades, 2x Death's Head grenades. The Raven Type II GL is a development of the standard grenade launcher. It has a six shot capacity allowing a trained soldier to quickly fire and suppress multiple targets. Special – Every use of the Type II GL consumes one reload/grenade. Assault Marines are recruited from the most experienced and tough members of the NMC. Their role is simple, to spearhead any landing and break the enemy's resistance on the shore. To accomplish that the Assault Marines have been equipped with the best armor and weapons available. Wearing Tortoise Mk. 2 armor and carrying modified M74 Assault Carbines they are a nigh unstoppable force of war. Prerequisites: Capitol, Military primary career. Mandatory Skills – Ranged Weapons, Resistance, Willpower. Elective Skills – Athletics, Close Combat, Survival. Signature Skills – Athletics, Ranged Weapons, Resistance, Willpower. Talents – Two talents from Athletics, Ranged Weapons, Resistance, or Willpower. Capitol offers freedom and land to all who want it, in return it expects loyalty and service from those who take the offer. Many people have chosen to strike it out in the Freedom Lands and elsewhere, all in the name of Capitol. These people are called homesteaders and are held in a silent reverence by the rest of the corporation. To live a life far from the safety and comfort of a city takes courage and a foolhardy streak, especially since the Dark Legion can strike anytime. But this does not matter to the average homesteader, to them the freedom to live as they want is the highest good there is. And if the Legion shows up they won't sell their lives cheaply. Mandatory Skills – Animal handling, Athletics, Survival. Elective Skills – Mechanics, Pilot, Ranged Weapons. Signature Skills - Animal handling, Athletics, Mechanics, Survival. Talents – Two talents from Animal handling, Athletics, Mechanics, or Survival. Equipment – A farm in the Freedom Lands on Mars or in the Graveton Archipelago on Venus, M76 Liberty Rifle. “To the bold go the spoils” this sentiment is not some Imperial clan's motto hung in their decrepit castle, but the driving idea behind a small group of Capitolians. Instead of climbing the corporate ladder or trying to find a niche for themselves, they take over businesses or even whole settlements belonging to other corporations. They do this on their own and without any overt support from their mother corporation, which points out that these people are Filibusters, even though they hold shares of Capitol. To choose such a risky life is no small matter, as the penalties for such behavior are either death or a life sentence. But those who dare can find themselves the masters of vast and wealthy domains. Prerequisites: Capitol, Command Expertise 1. Mandatory Skills – Command, Persuade, Survival. Elective Skills – Observation, Pilot, Ranged Weapons. Signature Skills - Command, Observation, Persuade, Survival. Talents – Two talents from Command, Observation, Persuade, or Survival. Equipment – Heavy Civilan Shoulderpads, Ballistic nylon clothing. Service as one of the Life Dragoons consists of standing around and watching tourists make fun of you. There are few greater honors to be had in Imperial service. They do not directly protect the Serenity, that's what Clan Empaya and the ISC-9 are for. Instead they make sure no one dares to attack the Imperial heart and brain, the Reading palace and the Parliament. They are also stationed at Imperial embassies, which is the duty of the 4th Serene Dragoons. At Paladine palace on Victoria, the 5th Lancers keep watch not only over the city but also on other corporations. The Old Guard is quartered in the Wood Barracks on Luna together with the 3rd Armored Cavalry. The 2nd Young Guard travels aboard the HSS Indomitable, a massive assault transport able to quickly deploy them at a moments notice. Every single of the Life Dragoon units has a distinctive uniform, which signifies either the heritage of the unit or their origin. 1st Old Guard “The Contemptibles” - Bearskin hats. 2nd Young Guard “The Black Watch” - Black kilts. 3rd Armored Cavalry “The Greys” - Grey pants. 4th Serene Dragoons “The Blues” - Dark blue uniform. 5th Serene Lancers “The Serenity's Reds” – Blazing red uniform. Prerequisites: Imperial, Military primary career, Observation Expertise 1. Mandatory Skills – Close Combat, Ranged Weapons, Observation. Elective Skills – Lifestyle, Persuade, Pilot. Signature Skills – Close Combat, Ranged Weapons, Observation, Pilot. Talents – Two talents from Close Combat, Ranged Weapons, Observation, or Pilot. Equipment – Life Dragoon uniform, Add the following if previously unowned - Mk. XIB Invader Battle Rifle, Mk. III Heavy Assault Armor. The 'Rooks are the smiling criminal masterminds plaguing Imperial society. They are the eternal foils to the plans of the Yard, and sometimes their greatest allies in rooting out heresy. The way to become a 'rook is long and perilous, for to become acknowledged as one is to prove oneself constantly to one's peers. A bare minimum requirement lies in being the a great swindler, a skilled thief or a highwayman of renown, all this served with panache and bravado to an audience of fellow criminals, the press and Gendarmerie. And after the deed is done they party as if there was no tomorrow, because in their line of work you never know. Mandatory Skills – Close Combat, Persuade, Thievery. Elective Skills – Education, Lifestyle, Stealth. Signature Skills – Close Combat, Education, Persuade, Thievery. Equipment – Rapier Cane, Ballistic Trenchcoat, Bowler or Top hat. At long last, the minor clans from the Imperial book. As an extra I've thrown in clan Kingsfield before their fall. Trappings: Your ancestor's Gendarmerie hat; Belt buckle or tie with clan emblem; Collection of law texts (Personal Library, Education). who has betrayed Imperial). Your actions see you rewarded and promoted; increase your Earnings Rating by one. Trappings: Ancestor's Kukri; Shoulder pad with Clan emblem; Military-issue wristwatch. Trappings: Pin or tie with Clan emblem; High-quality briefcase; Newspaper subscription. Avaricious - When you Apply Cash to purchasing an acquisition, you may re-roll as few or as many as you wish. meeting someone important; Membership in an exclusive club. Trappings: A deck of marked cards or some loaded dice; An old slicer; Basic fake ID. unnoticed, increase the difficulty of Stealth or Persuade tests by one if your identity is known. Trappings: An old Black Hearts dress uniform; Pin, tie or shoulder pad with Clan emblem; A heirloom rifle; recommendation to an exclusive Imperial tailor. The Whitestar preview has been released to the backers. I'm not convinced by several design choices, and have talked about them with Marc Langworthy in the KS update section (nr. 135). Here are a few things I created to adapt Whitestar in my games. With the exception of larger communities Whitestar outposts in Siberia are either small or severely under supplied. The vast distances and outside hazards offer little respite for the hard pressed Siberians. Their daily life is filled with danger and uncertainty. Many of their bunkers are ad-hoc constructions that need constant repair, mostly with resources scavenged outside. Others are constantly attacked by bandits and blood giants. This has forged the Siberians into a tough people who now that every single one of them must do his duty, lest they all die. When the bombs fell the bunkers in the Ukraine were filled to the brim, those in the Caucasus were so deep within the mountains that the people inside didn't know what was happening outside. Both regions contained people who in the past fought with each other due to ethnic differences, when they joined Whitestar they did it however as one people, since to their new brethren they were all foreigners. Whitestar strongholds in the Ukraine are hard pressed by the Sons of Rasputin, several were lost when the Sons revealed themselves. The Strongholds in the Caucasus are so distant from the main Whitestar bunkers that they have to rely on whatever tech and supplies they can scavenge. Luckily for them Bauhaus has abandoned many labs and depots in the mountains during the exodus. The reason for those changes is simple, the WS book does not offer rules for Siberia or the Caucasus. Instead it has rules for places that are then ignored in the rest of the book like central Europe. The Samopal rifle is a marvel of human ingenuity, it is a construction cobbled together from spare parts and junk. Made to offer a degree of protection to its wielder, this box fed rifle fires heavy slugs which can drop an unarmored foe with one shot. And while incredibly ugly the rifle is one of the cheapest in existence. Whitestar has a presence in the Asteroid belt, they riffle through abandoned asteroid labs to find salvage. The one faction scared by this would be Cybertronic, they found the Immortal on such an abandoned asteroid, and they surely won't be happy if someone else finds powerful tech there. So inspired by such fears I created an IC of assassin/infiltrators to deal with the problem. The Vector program was instituted as a reaction to the attempts made by Whitestar to establish salvage operations in the asteroid belt. With many labs and bases lying forgotten between Mars and Jupiter, Cybertronic cannot risk a discovery of powerful technology by Whitestar. The Immortal was found there and no one knows what else is lying dormant on those abandoned pieces of rock. The Vector infiltrator/assassins are trained and equipped with two aims in mind, driving Whitestar personnel peacefully or killing them outright in a gruesome fashion. After the first few deployments Cybertronic's analysts realized that Vector's could also be used for reconnaissance missions in asteroid belt. Their adaption to the unique environment of abandoned asteroids meant that they could be sent there without special equipment. The majority of Vectors is recruited from the IES VAC/TIFF, other come from MCR VAC to be used in direct engagements. The smallest and newest group of recruits comes from ARD TIFF. Prerequisites: Cybertronic, Stealth Expertise 1. Mandatory Skills – Close Combat, Stealth, Vacuum. Elective Skills – Linguistics, Observation, Mechanics. Signature Skills - Close Combat, Linguistics, Stealth, Vacuum. Talents – Two talents from Close Combat, Linguistics, Stealth, or Vacuum. Created for the ISC as the perfect assassination weapon, this SMG has it all from high caliber bullets to a superb silencer. After the initial problems were corrected, the Mk. IIIs became a favorite for ISC-5 agents performing gangland-style hit & run assassinations. A limited number of Mk. IIIs has reached the open market, and the operators lucky enough to buy them swear that there is no finest weapon in this category. Special – The Mk. IIIs Eliminator comes with an integrated silencer. The cost of the silencer has been already added to the cost of the weapon. To finish the post, I updated the posted clans with new status/earnings values more in line with the Imperial book. I covered that in the fluff for the most part. The reason I didn't go with that as a requirement is that looking at their stats in WZ, they're seriously kickarse combatants, the sort of group that are professionally trained, not just angry women out for revenge. It's still a nice legend to go with, so I ran with the line that the 'war widows and mourning lovers' is a fiction that they play up to increase their reputation, and it would certainly be appropriate for a vengeful widow to join their ranks to seek some closure. Fair point. I'd probably shift a point from Strength to either Awareness, Mental Strength or Personality. There's lots of ways for a creative player to exploit this with a miscellaneous action, say by taunting the foe, intimidation, etc. It's just something the GM's going to have to decide what it does. Also, it gives the career a skill that's useful outside of battle. Basically because what I was defining as an 'Alpha' is equivalent to a squad leader/specialist, which is also why I gave them access to Command as a skill. They're not supposed to be analogous to Wolfbanes, but more akin to a Wolfbane specialist (eg a headhunter etc, which if I was doing up as an IC I would have as a higher difficulty then a Wolfbane). They also get more skill picks then a basic Wolfbane, again tying in to their more specialist role. 1st gripe: I was torn here how to portray it, as the careers aren't very consistent in regards to what is replicated and what isn't. I erred on the side of caution, but in hindsight I probably should have used the Vestal/Valkyrie Career/IC as a template and not given the Alphas the basis Mourning Wolf gear. 2nd gripe: Yes it's a weapon pick, but TBH it's not that much less restrictive than the 'pick a corp handgun/assault rifle' that's in many basic careers, and it's certainly more restrictive than the 'pick any weapon and any armour' Doom Troopers get. It's also mitigated a bit by the fact that neither career gives the character Ranged Weapons, and it does not give the character access to anything with real reach or firepower (no sniper weapons, heavy weapons, etc). My personal and biased opinion, I would do it differently. Instead of having a primary career and an IC, I would just go with an IC. More seriously, it's stated in WZ that it's more common for a Mourning Wolf to be a part of a pack for a while, then move on to other careers. It's a rare Mourning Wolf that sticks with the pack for longer then a tour (assuming they survive the experience, of course). I wanted the career options to reflect this, so a basic career, followed by an IC to represent those who have decided that the pack-life is where they want to be, and are hard enough to survive it. At least half the Brotherhood ICs have a talent as a prerequisite, namely Mystic (though yes,. And I admit I made the prerequisites hard for this IC, because well, they're swordmasters, not 'not too bad with a sword' You only get into the careers by being the best of the best. Also, the IC gets 3 talents to the Wolfbane's 1. True, but it's not like it overpowers the IC. It's really focussed, but it's weaker in other areas as a result. Not to mention, to use that ability, you have to get up to the other guy first. True, they're pay is one grade higher then everyone else's. Fluff-wise, it's because they're not special forces per se, they're martial arts masters *within* a special forces unit. The extra income is in part to reflect this prestige status. It's also an attempt to give them some parity with the only other D3 military unit I could compare them to, namely the Doomtroopers. +1 Corruption Soak didn't feel right, and it seemed against the grain to give them free weapons picks when they're focussed CC experts (it's even in the name 'swordmaster'). In finality, the IC may be a bit restrictive and specialist, but at what it does it does very, very well. I made it as much to fill a hole in the fluff (at least as I saw it) as much as to create a balanced IC. It may be a bit situational as a result, but it's still a career that fits a theme and would be fun to play. Ok, let's say that I mostly agree with your reasoning for the Mourning Wolves. The Mystic talent has special rules connected to it, as there are only two ways to learn it for a Brotherhood character. One is to have the "Brotherhood Apprenticeship" education, the other a rare Brotherhood career event. And the prerequisite for the talent is really a prerequisite for the use of Art. Just look it up on page 46 in the core book. The D3 test is hard enough to qualify for the IC. they're martial arts masters *within* a special forces unit. Who would still be paid according to a military pay chart, which even for extreme specialists is limited. The difference between earnings 3 and earnings 4 is the difference, between middle class income which most officers and senior non-commissioned officers earn, and what an experienced barrister takes home (which on average is what a colonel takes home, and after 10 years it eclipses generals). I just don't see a swordmaster taking taking a colonel's pay home. And here's another problem, the Highland Clan Warriors aren't Doomtroopers. They are a mid-level special unit, like say the US Rangers, which tackles military requests from clans as per the old 1ed fluff. Doomtrooper equivalents in Imperial are the Blood Berets and the Wolfbanes. I don't expect to convince you, but to me the Swordmasters are not really playable. -If Heritage Foothold or Heritage Hotspot are rolled roll on TIFF Origin Table, Planet column to determine your origin. -For your Adolescent Event table use the one provided for TIFF characters on page 53. Your character has not been mind-wiped and has no connections to other corporations, save for those received from an TIFF adolescent event or a Career event. I just finished the last Mishiman guard unit, with it complete the players have a choice between becoming experts in tunnel warfare (Lord Moya), cunning warrior-diplomats (Lady Mariko), and mobile assault infantry (Lord Maru). In contrast to the guard units of the other Lord Heirs, the Blue Banner Guard really guards the Lady Heiress Mariko. Since her ascension the Blue Banner Guard has become an eclectic collection of warrior-diplomats, experienced soldiers, and skilled bodyguards. They all combine their skills to protect the lady heiress from all threats, foreign and domestic. Their preferred tactic is to avoid direct confrontation and instead use a wall of etiquette and propriety to steer potential problems right into the arms of the Crimson Lotus society. With which the Blue Banner Guard has a good understanding, based upon an agreement that two groups should never meet in person. During official ceremonies and combat situations, the Blue Banner Guard wears special armor made only for them and utilizes the Shogun rifle, offering the enemy a deadly wall of magnificent white-blue armored figures. Prerequisites: Mishima (Any Samurai), from Mars. Talents – Two talents from Close Combat, Observation, Persuade, or Ranged Combat. Equipment – A set of outrageously understated Kimonos, Blue Banner Armor, if not previously owned the character receives a Daisho (Katana & Wakizashi) and a No. 1 Shogun assault rifle. The Blue Banner armor is a masterpiece of unpowered Samurai protection. It is produced by Shinwa in a secret workshop on Mars, and only for the members of the Blue Banner guard. It utilizes technologies thought lost during the Fall, including a process which creates ceramic plates made out of hundreds of layers all pressed together. Its interlocking mountain pattern offers maximum flexibility without compromising protection, a feat which other corporations can only dream of. "A golden opportunity" that's the motto of Clan Rowan. They produce the most important product needed by the Imperial society, grains. Most of the bread and cereal production in the corporation is based on the output of clan Rowan's fields. And the Rowans never forget to remind everyone about it. This makes them all look like provincials aspiring to join high society, especially since for all the grand standing the clan's power is mediocre at best. Being a clan of farmers isn't glamorous and the Rowans often need help defending from Capitol and the Dark Legion. The troops that guard the lands of clan Rowan can expect to be fed directly from the vast clan larders and housed on the clan estates, making protecting the clan very comfortable. Being tightly bound to their land made clan Rowan into some of the best experts not only in agriculture, but also in everything else connected to soil and earth. Those clan members not interested in tending to the crops often find employment serving as soldiers, surveyors or geologists. The Rowans attracted towards war have many choices open to them, the Trenchers prefer to recruit Rowans as sappers, the reserve troops and the clan brigade are more than happy to have another body manning their posts, and lastly a talented member of clan Rowan can serve in the Thorns, the clan's special forces unit. Appearance: The Rowans are fastidious to a fault when it comes to dress. They do everything to present an image of agrarian succes, to the point that they have become the benchmark with which every farmer is measured. In the field they attempt to do the same, with varying levels of succes, especially since the Thorns have gained a reputation for less than impeccable appearance. Trappings: Belt buckle or shoulder pad with clan emblem; Used family car; A heirloom weapon. Farmer - You no longer suffer the untrained penalty for the Animal Handling and Survival skills. If you are trained in those skills, you may re-roll a single d20 on any test involving them. The Thorns are experts in defensive fighting. Their specialty is to set up multiple lines of trenches, minefields and bunkers to stop an enemy advance. Where the Trenchers fight protracted engagements, the Thorns swoop in and create defensive positions on the fly, turning open terrain into a deathtrap in a matter of hours. And they do this all with the protection of resources and possessions in mind, Imperial has no use for land that has been turned into a poisonous wasteland by fighting. Prerequisites: Imperial (Clan Rowan), Military Primary career. Talents – Two talents from Close Combat, Mechanics, Observation, or Ranged Combat. This collapsible multi-tool has been a staple piece of equipment for infantrymen since long before the exodus. The UET is a combination of a spade which can be adjusted to serve as a pickaxe, axe, saw, mine spike and crowbar, all in a handy package that can be carried in a waterproof bag. In a pinch it can also serve as an improvised weapon. Special: Gain a single bonus Momentum on any test when creating military fieldwork. The cities of Bauhaus are inspired mostly by imperial Russian cities. Other inspirations include WWII German cities with their massive bunkers (Flakturm) and cities of pre-WWI Europe. Heimburg – Moscow (due to its Kremlin-like Homebuilder quarter). Trans-Martian Railroad – Trans-Siberian railway. San Dorado – New York and Los Angeles. Longshore – Venice combined with pre-Meiji era Kyoto. Sangoku – Kanto region during the Sengoku era (hence the name). Suritomo/Saat Gung – While the name is Indonesian, the description is taken from Frank Herbert's Dune novel. Suritomo is equivalent to House Harkonnen (Omi is Vladimir Harkonnen). Quanto – Golden Palace is the Kyoto Golden Pavilion, the Red Castle of War was inspired by the Okinawan Shuri Castle. Shoa – Hong Kong and Hashima Island. Ochoku – Ryukyu islands, also jungles of Southeast Asia. Palace of the Skies -Osaka castle and Potala palace in Lhasa. Southern Banners – Warlord China. Bauhaus on Mars has not been fleshed out in any way, so I came upon an idea to inject a more distinct identity to the homebuilders there. Since Bauhaus on Venus and Whitestar are both heavily Russian I decided to go west and south. Inspired by French Africa and some other elements, I present to you the Bauhaus Army of Mars. Bauhaus Army of Mars specialist units. The Bauhaus Army on Mars is a specialist force created to provide security to the recent spate of colonization attempts in the Freedom Lands. Recruited from local volunteers, foreigners and Venusian Homebuilders the BAM has established itself as the most non-conformist section of the Bauhaus army. Its standard operating procedures are almost identical to the armed forces on Venus. But the geographical needs and logistical difficulties involved forced the Homebuilder officers to rethink their tactics, which resulted in the creation of new units providing the BAM with enough mobility and light troops to quickly react to enemy incursions. The enemies on Mars, save for the Dark Legion, pose a unique challenge. Both Imperial and Capitol use tactics against which the typical heavy armored tank assault doesn't work. Capitol attacks using its airborne infantry and superior air force, while Imperial sneaks in using special forces. To prevent them from driving the settlers from their homes the BAM has created light reconnaissance troops, and mechanized/airborne light infantry units. Thanks to them Homebuilders on Mars can sleep safely, knowing that rescue is just one radio signal away from them. The Storm Zouaves are the BAMs response to Imperial Highland Clan Warriors and other close combat specialists. While nowhere near the level of the clansmen, the Zouaves are still some of the best when fighting becomes close. To level the field they are well armored and use chainswords which can easily destroy clansman blades and wear heavy armor to protect themselves from the weapons used by Imperials. The Storm Zouaves are all recruited from local Hussars, even the officers are predominantly of local origin. This has created a strong esprit de corps among the Zouaves and led to the establishment of a distinct uniform, which differentiates them from ordinary Hussar units. This colorful uniform made out of red baggy pants, short blue jackets and yellow sashes, has been highly criticized by the military establishment outside the BAM, something the spirited Zouvaes relish. Prerequisites: Bauhaus, Military (Hussar) Primary career. Elective Skills – Athletics, Acrobatics, Resistance. Signature Skills - Close Combat, Ranged Weapons, Resistance, Survival. Talents – Two talents from Close Combat, Ranged Weapons, Resistance, or Survival. Equipment – Chainsword, MP-105GW, Zouave uniform. To prevent enemy troops form moving freely the BAM uses the Spahis, a light cavalry unit riding off-road bikes. Their primary role is to find enemy columns and delay them by destroying bridges and deploying mines at choke points. The Spahis are recruited from Dragoons showing initiative and a freedom loving streak, both attributes important for the long patrols the Spahis undertake. Shortly after the creation of the unit, its members started using long hooded cloaks worn by the Homebuilder drovers called the Burnous. This coarse woolen cloak offers the Spahis protection from the dust of the road and warmth when sleeping under the open sky. Prerequisites: Bauhaus, Military (Dragoon) Primary career. Mandatory Skills – Pilot, Ranged Weapons, Survival. Elective Skills – Mechanics, Observation, Resistance. Signature Skills - Observation, Pilot, Ranged Weapons, Survival. Talents – Two talents from Observation, Pilot, Ranged Weapons, or Survival. Equipment – Hussar Mk. IV armor, Licorne Combat Bike, Survival Kit, Burnous cloak. The Legion was created during the early days of the settlement of Mars, when many hopefuls arrived at the early Bauhaus settlements. Those wishing to join had no real option to do so, they were people fleeing their corporations or just hoping to find a better place than the one they were coming from. The local Homebuilders were loathe to dismiss people willing to work and fight for Bauhaus. They turned to manipulation, creating new identities for those who joined the militia. When the truth came out, the militia units made out of the foreigners have already achieved fame, valiantly defending their new homes against deadly odds. To cast them out would undermine the settlement effort, to the point where a mass defection to Imperial would be a distinct possibility. Instead the Dukes decided to maintain the foreigners as a special unit, called the Legion they would be tasked with the protection of the Martian homebuilders. Trained as paratroopers they would serve as the first unit deployed against the enemy. Today very few new recruits come from other corporations, the majority belongs to homebuilders from mars or people of Bauhaus heritage. To serve in the Legion is an honor to them, and many families pride themselves in having a son or daughter serving in it. The Legion has earned many rights since its founding, its members are allowed to wear full beards, instead of marching during parades they jog, they are allowed to wear the distinctive blue-yellow uniform with slashed sleeves together with the black plumed beret, their company grade officers are promoted from the ranks. And lastly, they are not allowed to be interrogated about their past by others. Prerequisites: Any non-Cybertronic, Athletics Expertise 1. Mandatory Skills – Athletics, Close Combat, Ranged Weapons. Elective Skills – Acrobatics, Resistance, Willpower. Signature Skills – Acrobatics, Athletics, Close Combat, Ranged Weapons. Talents – Two talents from Acrobatics, Athletics, Close Combat, or Ranged Weapons. Equipment – AG-17 Panzerknacker with Bayonet, Hussar Mk. IV armor, Legion uniform. Special: Replace your citizen talent with Subject of Bauhaus. You are from then on a commoner. You lose your Criminal Record if you had one. With little to no urban terrain the reserves on Mars have become, since their founding, expert outdoorsmen. They spend most of their training under the open sky, and prepare themselves for operations that do not include heavy fortified positions. This has served them well in the open fields surrounding Homebuilder settlements. Characters from Mars who pick the Military (Basic) career can choose the following changes to represent service as a Goumier. Rules: Replace Athletics with Survival in mandatory skills, replace Survival with Athletics in elective skills. The Vorreiter tracked bike provides great service on Venus, but it fails to provide the necessary mobility to the Spahis on Mars. Since the terrain on Mars is mostly flat where the Spahis operate, their needs differed. To provide them with a worthy "steed" the designers from Vinciano-Traffaux have poured all of their skill into the Licorne, a fast and agile combat bike. The first designs showed the ability to mount a light autocannon and even a small mortar on the back of the bike, but tests have shown that such solution would drastically reduce the mobility and capabilties of the motorcycle. Subsequent models of the Licorne have used the free space on the back as stowage, allowing the Spahis to operate almost self-sufficient long range patrols. Vinciano-Traffaux also offers the Licorne in a civilian version called the Coursier, it offers a bit more comfort for the user but no integrated holsters and ammo carriers for sidearms. Notes - Churning Up Dirt: Whenever a Licorne moves Flat Out, all skill tests to make a ranged attack against the vehicle increase in difficulty by one step. Pedal to the Metal: Licornes can travel quickly, but their design requires that speed come at the cost of control. A Licorne may gain the Agile quality for a turn, but if it does so, then it has a Combat Manoeuvrability of 0 during that turn. The commander may make this decision freely at the start of his turn. The favored troop transport of the Bauhaus Army of Mars, the Panthere offers quick and safe voyage to troops moving between settlements. While not as maneuverable as the GEV 10 Krait, it offers more flexibility and firepower to the troops of the BAM. It can either transport 14 fully equipped soldiers or carry a large amount of cargo. Its armored turret can mount either the MG-80 against human targets or the K-60 against light armor. In addition it also requires less maintenance as the complicated hovercraft, a trait sorely needed to troops operating on Mars. All Storm Zouave companies are equipped with the Panthere, with smaller numbers being used by the Reserves. Notes - Disembarking the vehicle is a Restricted Action. Added the missing Clan Rowan appearance entry. Here's the penultimate minor clan, only one more to go and it's already giving me a headache. Home: Ellis Barracks, Jamestown, Ganymede. Clan Ellis is a proud descendant of one of the captains of Murdoch Security, Joshua Donal Ellis, whose tactical ability was only overshadowed by bravery under fire. For his service in establishing the IDF and protecting Murdoch interests he was given his own clan. After rallying old Murdoch Security personnel to his banner, he married an impoverished MacGuire noble. His daughters all married into the most powerful clans, lessening the clans dependency on clan Murdoch. His sons continued in his footsteps, and since then command of the Blue Jackets was always held by one of his descendants. With their presence in the military clan Ellis has gathered many allies among other militant clans, while keeping them at arms length to prevent being drawn into inter-clan politics. More than 35% of all clan Ellis members serve in the Blue Jackets, another 25% in the general military, the rest follows other vocations. With most of the clan serving in uniform it has has become dependent on the Ministry of War for almost everything, from cash to basic sustenance. In time it became a problem for the Logistics Corps to supply the nomadic military clan, so they were given a permanent base on Ganymede to call home. To the chagrin of the bureaucrats clan Ellis turned their new home into a fully fledged military base, no different than the many bases they were stationed in. Appearance: Members of Clan Ellis are known for their piercing and unyielding glares, they literally bore through anyone standing before them. Their harsh intensity doesn't win them any friends, as they count among the most militaristic Imperial clans. Not even the O'Loughtons, whose business is war, are so ready to use armed conflict to solve Imperial problems as the Ellises are. Social standing: Ellis 3, Affiliated Family 2. Earnings rating: Ellis 2, Affiliated Family 1. Special: Members of Clan Ellis cannot become unemployed unless they are cast out from the clan. Any member of Clan Ellis who becomes unemployed is immediately drafted into the Blue Jackets. Regiment – Parade! - You have been raised in a military family in a military fashion, everything you achieved you achieved through discipline and hard work. It made you harder and tougher than others. - Use the next best row of the Starting Wounds table (page 71 of the Mutant Chronicles rulebook) to determine your starting wounds. The clan Ellis 28th Regiment of Foot (The Blue Jackets) is an amalgam of a clan regiment and a line infantry brigade, with special laws governing their staff and organization. Only members of Clan Ellis are allowed to serve in the Blue Jackets, replacements from other clans are not welcome. If the unit falls under 30% standing strength it is immediately pulled from the line, which happened only thrice in the regiment's history. Among the line regiments only the Blue Jackets are allowed to enter combat with pipes, fife and drums playing, and with kilts instead of trousers. When deployed the Blue Jackets serve as an anchor, bolstering the line and providing an unyielding redoubt around which other units can rally. The hallmark of the unit is to become a point redoubt in both offensive and defensive operations, meticulously following orders and preventing others from wavering. Mandatory Skills – Close Combat, Ranged Weapons, Willpower. Elective Skills - Athletics, Resistance, Survival. Signature Skill – Athletics, Close Combat, Ranged Weapons, Willpower. Equipment - Mk. I Light Personal Protection Suit, Lyon & Atkinson Mk. XIb ‘Invader’ battle rifle, bayonet, uniform. PS: Can a mod please sticky this thread? It would help in preventing its disappearance into the depths of the forum. A quick redo of the Rams ISF IC, into two separate and canonically correct ICs (mostly based on their Warzone 1ed and UWZ versions). Thanks goes to HappyDaze for pointing out the inconsistency! The Rams are experts in hostile takeovers of mines and production facilities. They are tall on toughness and short on subtlety, preferring to slam into the enemy head on. Like a true ram would. Prerequisites: Imperial, Military Primary Career, Clan Loughton member. Mandatory Skills – Athletics, Close Combat, Resistance. Elective Skills – Acrobatics, Ranged Weapons, Willpower. Signature Skills – Athletics, Close Combat, Ranged Weapons, Resistance. Talents – Two talents from Athletics, Close Combat, Ranged Weapons, or Resistance. Equipment – Mk. III Heavy Combat Armour, Chainsword, Lyon & Atkinson PSA Mk. XIV ‘Aggressor’ handgun. People serving in Rams Air Cavalry, a small subunit of the larger special force, are insane maniacs. Because no sane man or woman would strap a small rocket armed helicopter on his back. Luckily the clan has never had a shortage of maniacs willing to do so. Mandatory Skills – Heavy Weapons, Pilot, Resistance. Signature Skills – Heavy Weapons, Pilot, Ranged Weapons, Resistance. Talents – Two talents from Heavy Weapons, Pilot, Ranged Weapons, or Resistance. Equipment – Barracuda Air Support Vehicle, Mk. I Light Personal Protection Suit, Lyon & Atkinson PSA Mk. XIV ‘Aggressor’ handgun. Two ICs, one for Imperial and one for Bauhaus. Those serving in the Highland Clan warriors all rally to the call of their chieftains. These men and women are some of the best swordsmen in Imperial, outfighting even the elite Wolfbanes. Leading troops across the battlefields of the solar system they are often found where the fighting is thickest, where their presence and skill will tilt the battle in Imperial's favor. And when the fighting is over they lead their troops back to the mountain fortress of Strathgordon, to wait for the next call from a belaguered Imperial clan in need of their troops. Prerequisites: Imperial, Highland Clan Warrior primary career. Mandatory Skills – Athletics, Command, Close Combat. Signature Skills – Athletics, Command, Close Combat, Resistance. Talents – Two talents from Athletics, Command, Close Combat, or Resistance. Action creates reaction, oppression breeds resistance. Bauhaus is steering toward chaos, as the Ministry of Fear strangles dissent and opposition more and more people are starting to ask themselves “why?”. Why should they support an oppressive system? Why should thralls be excluded from the prosperity they create? Why is the way up closed to the talented because of their birth? And those people aren't isolated , they are getting organized, and what's worse even some of the nobility have joined them. Every time someone disappears or something blows up, the fears of the Ministry of Order officials grow. Mandatory Skills – Mechanics, Persuade, Stealth. Elective Skills – Lifestyle, Observation, Willpower. Signature Skills - Lifestyle, Mechanics, Persuade, Stealth. Talents – One talent from Lifestyle, Mechanics, Persuade, or Stealth. Equipment – HG-12 pistol, Fake ID (Restriction 3) or B&E kit (choose one). I'm also working on a modified Decision Four for Capitol, but it is a huge thing so don't expect anything soon.